The Eastern Tiger Swallowtail (Pterourus glaucus) is one of more than two dozen types of butterflies commonly found in Tippecanoe County. “The encounter is a day of family fun that celebrates the beauty of butterflies,” said Melissa Shepson, outreach coordinator for Purdue Entomology. “Participants need no prior butterfly experience; everyone from the novice to the expert is welcome. Gene White, a photography consultant specializing in insect images and a graduate of Purdue Entomology, will lead the workshop. It will include a brief introductory lecture and demonstration of photography techniques, a photo shoot and a photo critique. 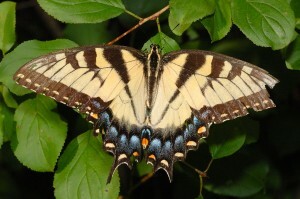 The Butterfly Encounter is free of charge, but participants are asked to RSVP for the picnic by July 14 to Sarah Wolf, Eli Lilly wildlife habitat coordinator at (765) 477-4424, wolfsa@lilly.com. Parking for the event is available next to the baseball diamond south of Eli Lilly Tippecanoe Laboratories’ main entrance at 1650 Lilly Road in Lafayette. A rain date has been scheduled for Sunday, July 19. Should the rain date be necessary, participants should meet at the shelter at 1:00 pm and the picnic will be held at the end of the event. No photography workshop would be offered.